Reading and share top 23 famous quotes and sayings about Benediction by famous authors and people. Browse top 23 famous quotes and sayings about Benediction by most favorite authors. 1. "Niagara made a careful gesture, like some religious benediction: a diagonal slice across his chest and a stab to the heart. ‘A slash and a dot,' he said. ‘I doubt it means anything to you, but this was once the mark of an alliance of progressive thinkers linked together by one of the very first computer networks. The Federation of Polities can trace its existence right back to that fragile collective, in the early decades of the Void Century. It's less a stigma than a mark of community." 2. "And off in the far distance, the gold on the wings of the angel atop the bell tower of San Marco flashed in the sun, bathing the entire city in its glistening benediction." 3. "At the moment they vanished they were everywhere, the cool benediction of the night descended, the stars sparkled, and the whole universe was a hill." 4. "With stillness comes the benediction of Peace." 5. "It is no sign of benediction to have been obsessed with the lives of saints, for it is an obsession intertwined with a taste for maladies and hunger for depravities. One only troubles oneself with saints because one has been disappointed by the paradoxes of earthly life; one therefore searches out other paradoxes, more outlandish in guise, redolent of unknown truths, unknown perfumes..."
6. "It was your little white soul I tried to keep near me- even when life was at its loudest and every intellectual idea of God seemed the sheerest mockery." - F. Scott Fitzgerald, Benediction"
7. "It was you, you who brought me the pardon. Pee on me, won't you. It would be like benediction. O, what a sleepwalker I have been!" 8. "But can one be a blessing merely by being cheerful? Yes; moral beauty of any kind exerts a silent influence for good. It is like a sweet flower by the wayside, which has a benediction for everyone who passes by. A legend tells how one day in Galilee the useful corn spurned the lilies because they fed no one's hunger. "One cannot earn a living just by being sweet," said the proud cereal. The lilies said nothing in reply, only seemed the sweeter, then the Master came that way; and while his disciples rested at his feet, and the rustling corn invited them to eat, he said, "Children, the life is more than meat. Consider the lilies, how beautiful they grow." It certainly seemed worth while then just to be sweet, for it pleased the Master." 9. "To look is important. We look to immediate things and out of immediate necessities to the future, coloured by the past. 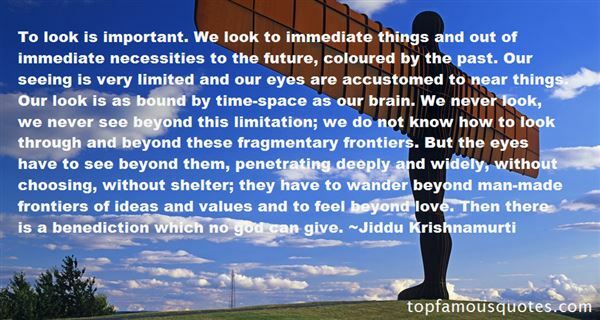 Our seeing is very limited and our eyes are accustomed to near things. Our look is as bound by time-space as our brain. We never look, we never see beyond this limitation; we do not know how to look through and beyond these fragmentary frontiers. But the eyes have to see beyond them, penetrating deeply and widely, without choosing, without shelter; they have to wander beyond man-made frontiers of ideas and values and to feel beyond love. Then there is a benediction which no god can give." 10. "To live well, to laugh often, to love much, to gain the respect of intelligent people, to win the love of little children. To fill one's niche and accomplish one's task, to leave the world better than one finds it whether by an improved flower, a perfect poem or another life ennobled. to never lack appreciation of earth's beauty or fail to express it, to always look for the best in others, to give the best one has. To make one's life an inspiration and one's memory a benediction. This is success." 11. "For Homer Wells, it was different. He did not imagine leaving St. Cloud's. The Princes of Maine that Homer saw, the Kings of New England that he imagined — they reigned at the court of St. Cloud's, they traveled nowhere; they didn't get to go to sea; they never even saw the ocean. But somehow, even to Homer Wells, Dr. Larch's benediction was uplifting, full of hope. These Princes of Maine, these Kings of New England, these orphans of St. Cloud's — whoever they were, they were the heroes of their own lives. That much Homer could see in the darkness; that much Dr. Larch, like a father, gave him." 12. "He felt like hearing Mrs. Grogan's prayer again, and so he went to the girls' division a little early for his usual delivery of Jane Eyre. He eavesdropped in the hall on Mrs. Grogan's prayer; I must ask her if she'd mind saying it to the boys, he thought, then wondered if it would confuse the boys coming so quickly on the heels of, or just before, the Princes of Maine, Kings of New England benediction. I get confused myself sometimes, Dr. Larch knew.‘Grant us a safe lodging, and a holy rest,' Mrs. Grogan was saying, ‘and peace at the last. 'Amen, thought Wilbur Larch, the saint of St. Cloud's, who was seventy-something, and an ether addict, and who felt that he'd come a long way and still had a long way to go." 13. "Blessing is the soveraign act of God, and the power of benediction like the power of God." 14. "Good night, Lisa. Sleep with the angels. "Her eyes stung from quick tears. It had been her mother's nightly benediction: Sleep with the angels. But then he added words her mother never had: "Then come back to earth and sleep with your devil, who would burn in hell for one night in your arms." 15. "There were the meaningless greetings the humans called "formalities": insincere inquiries into the state of health, nebulous benedictions and hopes for past well-being; all compensations for the lack of human Mediators." 16. "To us, our house was not unsentient matter -- it had a heart, and a soul, and eyes to see us with; and approvals and solicitudes and deep sympathies; it was of us, and we were in its confidence, and lived in its grace and in the peace of its benediction." 17. "Day offers two equally necessary sacraments - the benediction of morning and the absolution of dusk. In the morning coffee blesses and in the evening wine absolves." 18. 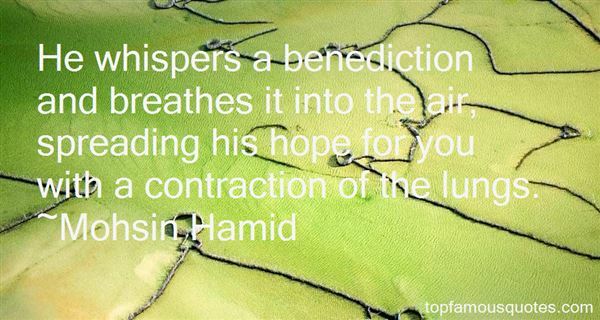 "He whispers a benediction and breathes it into the air, spreading his hope for you with a contraction of the lungs." 19. "I can worship Nature, and that fulfills my need for miracles and beauty. Art gives a spiritual depth to existence -- I can find worlds bigger and deeper than my own in music, paintings, and books. And from my friends and family I receive the highest benediction, emotional contact, and personal affirmation. I can bow before the works of Man, from buildings to babies, and that fulfills my need for wonder. I can believe in the sanctity of Life, and that becomes the Revealed Word, to live my life as I believe it should be, not as I'm told to by self-appointed guides." 20. "Heritage was everything: it was a golden skeleton key, gleaming with power, able to get the wielder through any number of locked doors; it was the christening of the marriage bed with virgin blood on snow-white sheets; it was the benediction of a pristine pedigree, refined through ages of selective breeding and the occasional mercy culling.It was life, and death, and all that spanned between.It was his birthright." 21. "My heart tells me to stop right here, to offer quiet benediction and call it the end. But the truth won't allow it. Because there is no end, happy or otherwise. Nothing is fixed, nothing solved. the facts, such as they are, finally spin off into the void of things missing, the inconclusiveness of us. Who are we? Where do we go? The ambiguity may be dissatisfying, even irritating, but this is a love story. There is no tidiness. Blame it on the human heart. One way or another, it seems, we all perform vanishing tricks, effacing history, locking up our lives and slipping day by day into the graying shadows. Our whereabouts are uncertain. All secrets lead to the dark, and beyond teh dark there is only maybe." 22. "Living should be perpetual and universal benediction." 23. "The thought of our past years in me doth breed Perpetual benediction: not indeed For that which is most worthy to be blest— Delight and liberty, the simple creed Of Childhood, whether busy or at rest, With new-fledged hope still fluttering in his breast." You know it's going to hell when the best rapper out there is white and the best golfer is black."